I am so excited to get started with this quilt a long. If you are looking for a new project, this is definitely a fun, different pattern that looks like a lot of fun. I have a copy of the pattern to giveaway. If you are interested in participating, just leave a comment on this post telling me what colors you might use for your Groove quilt. I think the best part about participating in a quilt along is seeing how many different ways the same pattern can be made! I will pick a random winner on Sunday night. Pile O' Fabric has partnered up with Carolina Patchworks (Emily Cier) who is an amazing quilt designer and writer. She wrote Scrap Republic, Quilt Remix, and Pixel Play (coming soon). You can see her work in Modern Blocks, and she is one of the 16 Iconic Quilt Designers in the newly released book, We Love Color. For this Quilt Along we will be using Emily's Groove Quilt Pattern, which Emily will be offering at a discount for all QAL participants. It might seem a bit intimidating, but Emily assures it is much easier than it looks! This will nevertheless be a challenging Quilt Along in Solid Color Selection and Curve Piecing, but still achievable for the newer quilter—and rewarding, too! As you quilt along there will be wonderful tutorials and advice on fabric selection, piecing curves, and quilting techniques from amazing quilters. Emily's patterns are very easy to follow and always have instructions for crib, lap, twin, queen, and king. You are welcome to make this quilt any way you see fit, so if you prefer to use prints then go for it! It will be neat to see everyones own interpretation. Here are the current scheduled posts for the Quilt Along. We will be learning the ins and outs of curve piecing from amazing quilters Emily Cier, Jacquie Gering, Amanda Woodruff, and Kate Conklin. 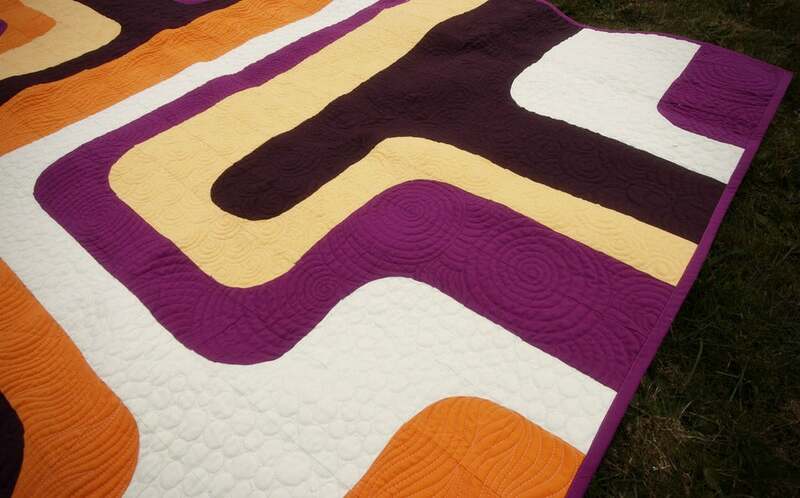 We will also be getting some Groovy Quilting tips from Quilting Extraordinaire Angela Walters. This will be a fantastic learning experience, and a great opportunity to meet some new quilting friends! 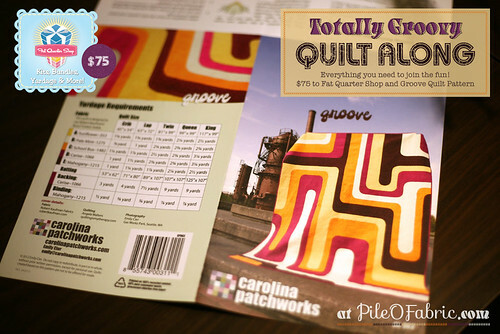 Carolina Patchworks will be offering all QAL Participants a discount on her pattern. 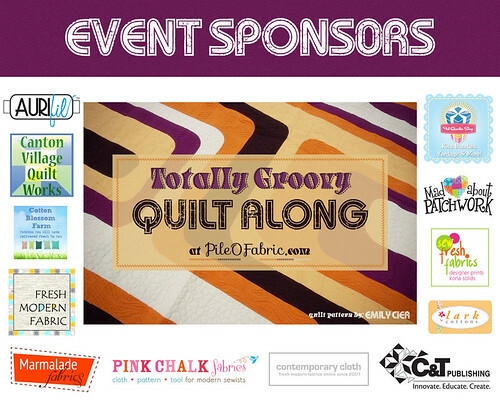 Pile O' Fabric is having a giveaway for a Totally Groovy Quilt Package! Everything you need to join the fun $75 to The Fat Quarter Shop to get your fabric and a Groove Quilt Pattern to Quilt Along! This giveaway ends July 31st. Join the flickr group, which can be found here. This will be a great place for us to come together and share photos of our progress and get to know each other. If you’d like to let people know what fun you are up to or invite your friends to join here is a button! Sign up and be entered into a drawing to win a pattern! Pile O' Fabric would like to get an approximate head count of you all. If you plan to join and Quilt Along please fill out the sign up form, this will NOT commit you to anything. If you sign up you will be entered into a drawing to win 1 of 10 Groove Patterns (paper). 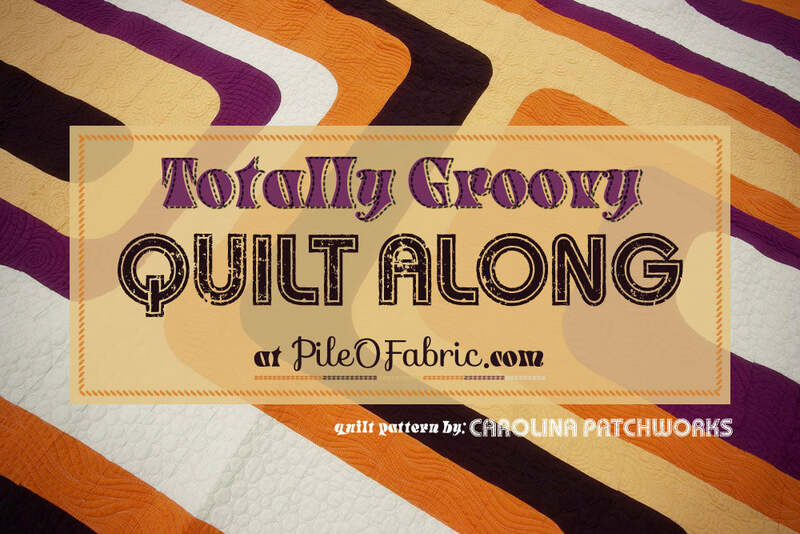 For complete details of The Totally Groovy Quilt Along you can visit Alyssa at Pile O' Fabric. I LOVE this pattern. I've really been digging shot cottons lately, so I'm hoping to include some of those in my version. I'm also thinking something with purple, teal, and lime green. So excited for this QAL! I'm thinking of the same colors as are in the Denim Kona bundle - light to dark bluish blacks. I'll probably change my mind again. ha! I'm thinking of red, blue and yellow from my stash. Blues and greens. Thanks for the giveaway! i think teal, black, dark blue and grey, but i should move away from that and use some warm colors instead maybe! I'm thinking of pale but highly saturated yellows greens and blues - I don't think I'd be happy with all Kona since it's not very lustery, so I'm waiting for my Moda Bella and Art Gallery Pure element color cards to get her so I can pick out just the right combo! Blues and purples with contrast of yellow, orange, green -- I'm waiting for a shipment of solids fqs to arrive before make my final choice. I love this pattern! It's so different than the quilts I usually make, guess I'm stepping out of the box. hehe. I'm not sure on colors. Maybe different blues or maybe red, white and grey. Hmmm. Every day my decision changes! I really have to decide and get my fabric order in! Thanks for the giveaway. I'm planning to do the this quilt in reallly bright Kona cottons!! Thanks for the giveaway! I don't know exactly, but my quilt will probably include forest green and navy blue. I am not 100% decided, but there will probably be some turquoisey - lime green action going on. I can't wait to see what everyone comes up with!! This is such a fun pattern! I think I'd like to try using Tula Pink's Wasp colorway from The Birds and the Bees. I love the pinks and oranges combined with turquoise. Or maybe I should just stick with solids?!! i am planning on using aqua and may be red/orange. I can't wait to get started!